I don’t know that any single of ice cream has ever been so rich and decadent. And after being pretty much sugar-free for 30 days, I was good after a single bite. After officially wrapping up the Whole30, I wanted sushi rolls – complete with white rice. Jason wanted ice cream. Actually, Jason just wanted dessert. Something completely over-the-top, no chocolate. And this ice cream totally qualifies as both. His favorite ice cream, pre Whole30, was Haagen-Dazs Dulce de Leche. And it’s insanely easy to recreate at home – fresher, better, and for less expense – with just a handful of ingredients. 1. Add more vanilla – you can never have too much vanilla to support those wonderful caramel notes. 3. Swirl additional dulce de leche into the churned ice cream before freezing (well, as much as one can swirl it). One small spoonful of heaven. 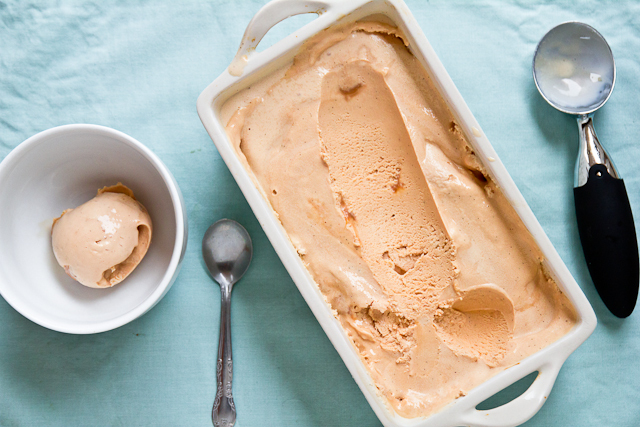 Rich, decadent homemade dulce de leche ice cream studded with vanilla bean flecks. Heat milk and cream in a medium pot over medium-high heat just until steaming. Remove from heat and whisk in 1 2/3 cup dulce de leche until completely smooth. Whisk in the vanilla and the scrapings of a vanilla bean. Transfer the mixture to a bowl and completely cool it (placing the bowl in the sink and adding ice water to the same level as the mixture inside the bowl will speed things along very quickly). Transfer the mixture to your ice cream maker and run according to manufacturer instructions. Scoop out 1/3 of the ice cream into your freezer-bound container, drop small spoonfuls of half of the leftover dulce de leche on top. Scoop out another 1/3 of ice cream and repeat, using the remainder of the dulce de leche. 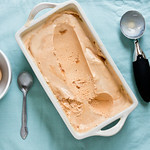 Scoop the remaining ice cream over top, using a knife held vertically, give the ice cream a couple of swirls, and then transfer the container to the freezer until solid. I should not have looked at this! I need this now! Wow, congratulations!! And I wish I could say one bite is enough for me. You’re AMAZING! This is the perfect way to celebrate. That flavor is tied with caramel cone crunch for my current favorite ice cream…so I definitely need to give this a churn (and save myself quite a bit of money lol). This looks amazing! Good for you guys – you have much stronger willpower than I do! Ahh.. I want Dulce de leche now…….. 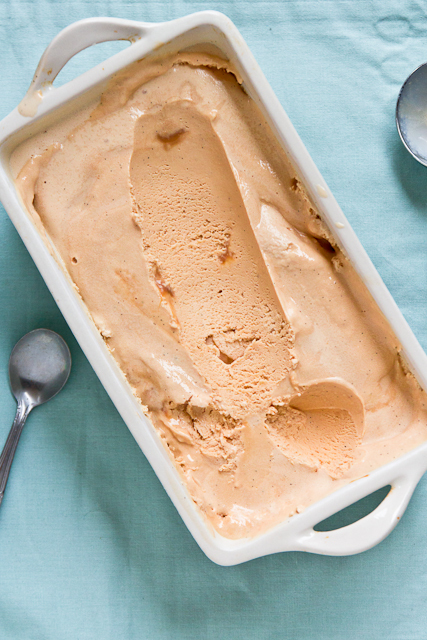 I love Dulce de Leche so this ice cream will be on my list to make real soon. Gosh is this ice cream gorgeous. Gorgeous! Why oh why do I not have an ice cream maker….. I need to make this! this sounds so creamy and delicious! This is gorgeously creamy! So pretty. Just made this tonight (made caramel in the crockpot yesterday) and it was AWESOME! Best kind I’ve made yet according to my hubby. We probably won’t share any more of it with the kids 🙂 The texture and flavor are amazing! This ice cream looks and sounds AH-MAZING! I totally commend you for going without sugar for a month; this dessert was probably the perfect way to break that spell. 🙂 Love the additions you made to the recipe – vanilla bean is always awesome and the swirls of dulce de leche sound heavenly! This recipe could be useful for someone looking for a simple yet tasty dessert. Thank you for sharing. Don’t you do steps 7,8,9 if you don’t have an icecream maker? 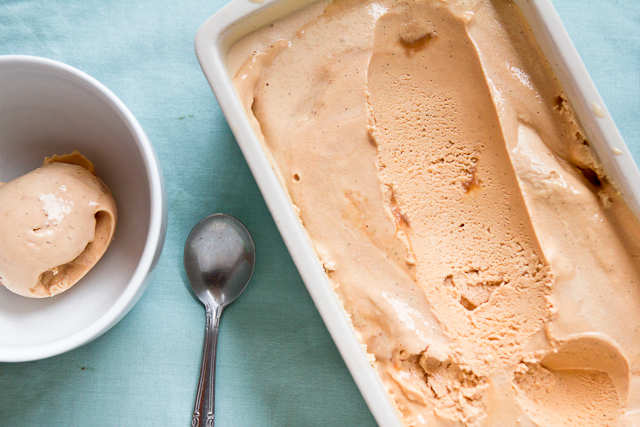 Yep – you’ll need to swirl in the dulce de leche either way. Can I use whipping cream instead of the heavy cream?